The recent gun control debate ignited by last month’s tragedy in Parkland, Florida, has liberals trotting out what has become a favorite Leftist talking point - Australia’s 1996 National Agreement on Firearms, an act which, among other things, severely restricted semi-automatic rifles after after a similarly horrific mass shooting. Liberals consider the cornerstone of the law, a massive forced gun buyback program, a “common sense” approach to what might otherwise be perceived by gun owners as an unwelcome curtailing of traditional American freedoms. Sure, the government may be forcing gun owners to make the transaction, but exchanging money for items IS capitalism, right? And it sure beats the alternative, a Communist-style door-to-door roundup of weapons that both sides agree would likely lead to civil war. Don’t get me wrong, I think most true Leftists would LOVE to harness the power of the State to crush liberty-minded gun owners by every means necessary, and if a few of the right eggs are broken in the process, so much the better. But realists on both sides know such a scenario is highly unlikely to happen, at least to a result the Left would want. In all likelihood, open displays of tyrannical force such as openly rounding up certain people groups or door-to-door weapons confiscations are highly likely to result in open displays of resistance, and a civil war that is likely to be fought, and won, by the good guys. “There is no other way around it: The mandatory confiscation of the American citizenry’s guns would involve tens of thousands of heavily armed federal agents going door-to-door to demand of millions of Americans that they surrender their guns. That. Is. Not. Going. To. Happen,” opines National Review’s Mark Wright. Sure, it’s hard to argue with Mehta’s logic, at least on the surface. And it’s a good thing for gun owners, right? Not necessarily, not if you look just beneath that surface. And yet, they do want more and more laws on the books, and the more draconian, obscure, and hard to keep track of, the better. But why? They want to make de facto criminals out of the majority of the gun owning population. That way, they can essentially pick us off, one by one. If liberals are able to pass any sort of “assault weapons” ban, buyback or no buyback, they know they will make criminals out of several million currently law-abiding gun owners. And even if the majority of those gun owners don’t follow the law now, that won’t make them any less a criminal. They just haven’t been caught yet. But when the ‘right people’ control the levers of power and the ‘right laws’ are all in place, make no mistake - they will be caught. Here’s the rub. It’s one thing to hold up your rifle and shout “come and take it,” à la Charleton Heston, before thousands of like-minded people. 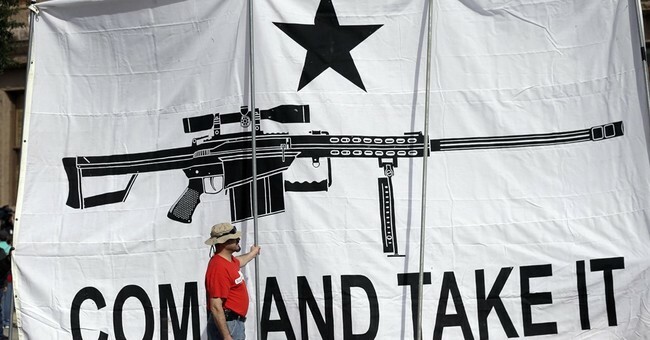 The Feds aren’t going to come to a National Rifle Association convention and start arresting people, at least not yet. And they aren’t going to conduct door-to-door house searches, arresting gun owners and confiscating their firearms, either. Not yet. But believe me, under the right circumstances and with the right laws in place, the arrests will come. They’ll come when you’re going to work, or to the bank, or to the park with your kids, or a thousand other places. They’ll come after you’ve used your now-illegal AR-15 to defend yourself against a home invader, or if they spot it during a “routine” home search. Never, ever underestimate these people and the depth of their evil. Remember, the Cheka managed to fill the Soviet gulags to the brim, and yet they did it quietly, with little fuss and even less armed revolt. And they won’t need to arrest everyone to make the majority obey. No, they only need a few, and word will spread quickly. So what will you do, dear AR-15 owner, when the ‘Cheka’ comes for your neighbor, and you know the laws are on the books to prosecute? Will a “buyback” and “amnesty” be enough to convince YOU to acquiesce? You’ve got a job, a wife, kids to raise. When they “come and take it,” is your family worth risking? No, when they take your guns there will be no civil war. There will be no large-scale revolution, because liberals are experts at pushing that Overton Window enough not to shock the system. Like frogs in water that’s about to boil, people won’t jump until it’s too late. That is why it’s so important to not get complacent and believe a worse case scenario will never happen. That’s why it’s critical to fight the gun controllers’ efforts to change the law at EVERY turn, using EVERY legal means possible. Long before they “come and take” our guns, and our freedoms.